As of the end of June 2017, 4.7 million tons and 17.7 billion dollars’ worth of plastics production was realized and if this progression continues, the production is expected to rise to 9.4 million tons with a value of 35.5 billion dollars. In this case one can expect that the total plastics production in 2017 may increase by 6.3% at quantity base and 5% at value base compared to 2016. The average capacity usage in the plastics sector in June 2017 was 75.8% which was 3.2% behind the average capacity usage of general manufacturing industry (79%). As of the end of June 2017, plastic packaging materials, with a production volume of 1.885 million tons, set the pace within the total plastics production of 4.7 million tons, followed by plastic construction materials with a volume of 1.37 million tons. Machinery and equipment investment in the plastics sector realized 441 million dollars at the end of June 2017. If this rate continues, it is estimated to reach 883 million dollars by the end of 2017, with an increase of 0.3% compared to 2016. At the end of June 2017, 37% of these total investments were presses and other machinery, 19% injection machinery, 15% extrusion machinery, 22% accessories and parts. Thermoform and bulging machinery held a share of 3% and 4% in the total investment value respectively. As of the end of June 2017, 798 thousand tons of plastic products with a value of 2.86 billion dollars were exported. At the same rate, plastic product exports are estimated to reach 1.6 million tons with a value of 4.17 billion dollars. An increase of 3% at quantity base and 1.6% at value base compared to 2016. At the end of June 2017, the product groups with the biggest export share both in quantity (46%) and value (42%) were product groups with customs tariff number of 3920 (other sheets made of plastics, leaves, pellicles and lams) and 3923 (plastic products for the packaging of goods handling, plugs, lids, capsules). Turkey exports plastic products to approximately 150 countries. At the end of June 2017, 10 countries had a share of 47% in quantity and 45% in value of the total exports if plastic products. At the end of June 2017, 300 thousand tons or 1.474 billion dollars of plastic products were imported. At this rate, estimates are that by the end of 2017, 600 thousand tons (2.949 billion dollars) will be reached, an increase of 1.8% in quantity and 0.7% in value compared to 2016. Over the first 6 months of 2017, the product groups with customs tariff number of 3920 (other sheets made of plastics, leaves, pellicles and lams) had a 44% quantity and 32% value share in the total plastics imports. Each year, Turkey imports plastic products from over 100 countries. At the end of June 2017, 10 countries represented 70% (quantity) and 73% (value) of the total plastics imports. Since 2014, China is the biggest supplier of plastic products. Late June 2017, China's share was 24% (quantity) and 18% (value), retaining its first place for volume and sharing the first place together with Germany when looking at the value of imports. 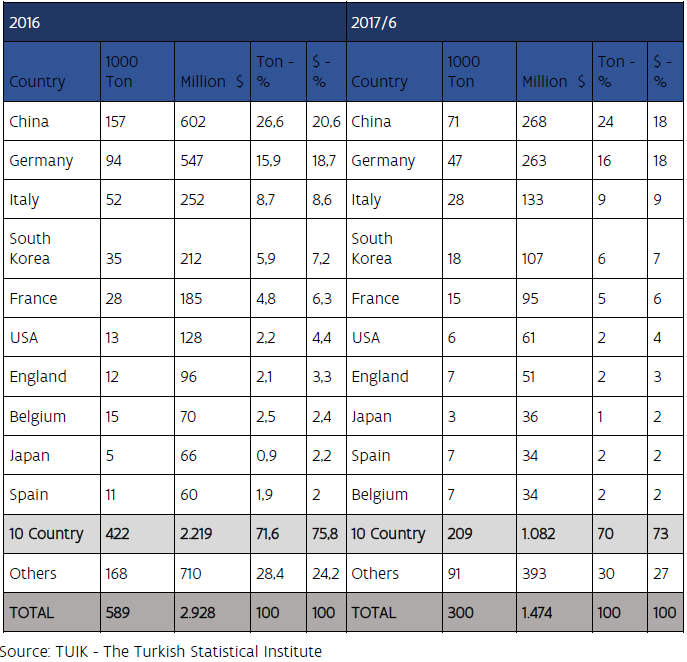 Besides these two countries, Italy, South Korea and France retain their position amongst the countries which supply plastics tot Turkey. For the first 6 months of 2017, the total production of plastic raw materials is estimated to be around 507 thousand tons. 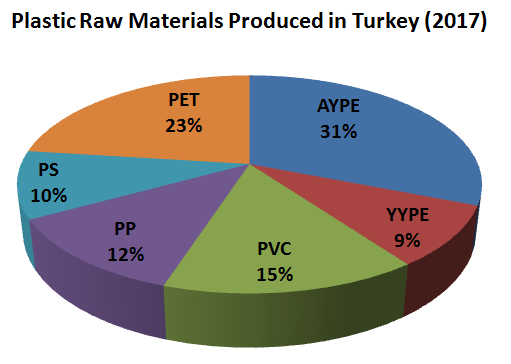 AYPE constituted 31% of the total plastic raw materials produced in Turkey by the end of May 2017, whereas YYPE is 9%, PVC 15%, PP 12%, PS 10% and PET 23%. At the end of June 2017, plastic raw materials imports amounted to 3.498 million tons with a value of 4.9 billion dollars. If this trend continues, plastic raw material imports at the end of 2017 are estimated at 6.99 million tons and 9.82 billion dollars with an increase of 7.3% (volume) and 12.9% (value) compared to 2016. Late June 2017 polyethylene and polypropylene had the largest share in imports of plastic raw materials, both volumes 56% as in value 52% with a share of 56%. For the supply of raw materials, Turkey is still highly dependent on imports, which amount 87% of the total supply. At the end of June 2017, Turkey exported 409 thousand tons of plastic raw materials with a value of 541 million dollars. At the same rate, total exports for 2017 are expected to reach 818 thousand tons (1.82 billion dollars), increasing the volume 9.9% and the value 17.8% compared to 2016.